Happy Friday lovelies! This was my first full week back in the office since the week before Thanksgiving so I'm definitely ready for it to be the weekend. I've felt "off" all week and I felt like I was coming down with something on Wednesday/Thursday so I'm really hoping to get to relax and recoup this weekend even though I already have several things scheduled for the weekend. Since the holidays are right around the corner I'm putting together a little wish list for this weeks Friday Favorites! 1 // You can never go wrong with David Yurman. I love the minimal yet classic look of this bracelet and the two tone makes it perfect to go with everything! This is a bracelet you could easily wear with every outfit, every day. 2 // I've been debating between a pair Reva flats and a pair of Tieks but when I saw these gold and cork Revas I fell in love! They're so different and fun and are perfect for dressing up or down. 3 // Love Rebecca Minkoff. I wear my gray Mini Mac every where so when I saw this gorgeous bordeaux Mini 5-Zip I fell in love! Such a great color for every season! 4 // Bar cart accessories! I love having a bar cart and getting to decorate it so I'll never say no to fun things for it. I love this koozie, this decanter and who doesn't need a cute jigger? This bottle opener would be a perfect accessory and I love these stemless wine glasses! 5 // I keep going back and forth between wanting a fitness tracker and not wanting one. I don't do a ton of cardio so I don't know if they'd really be that beneficial to me but I love that the new Jawbone trackers are so cute! This one and this one both look like a bracelet I'd wear normally. They might not have the Tory Burch accessories for the Jawbone but it's nice to see them trying to make them more fashionable. Hope you feel better soon and are able to kick whatever ails you. The first full week back is ALWAYS the toughest for sure. David Yurman has so many beautiful pieces, I love his work. And those bar cart accessories are beyond cute! Happy Friday! I've had my eye on that decanter too! I love it! Those bar cart items are wonderful! I just bought some glasses that look just like that, but the store only have two. I need to buy some more online! 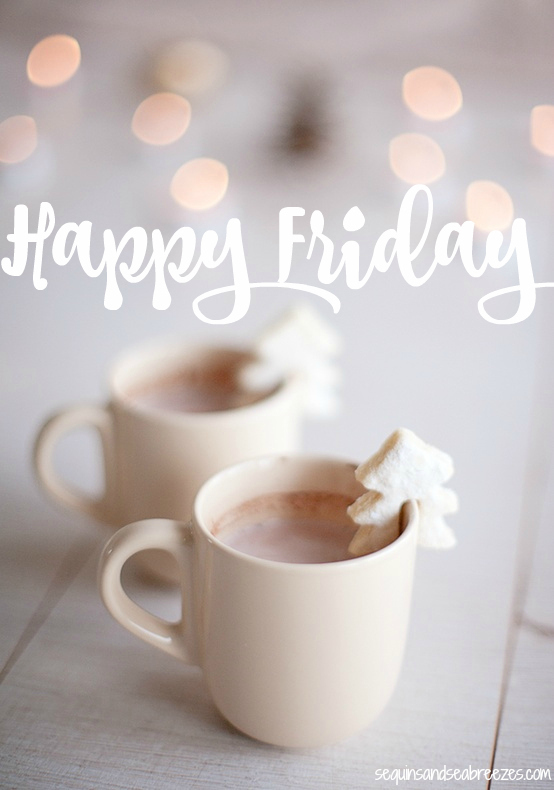 Thanks for sharing :) Happy Friday! Those bar cart accessories are adorable! And so are those pretty flats! Yes to all of this! I had that DY bracelet in pearl - and somehow lost it. I still haven't gotten over that one. And the RM bag is one of my faves! Happy Friday, girlfriend! I love those bar cart accessories! They're just too cute! And those flats are so beautiful! I also really love that bag. It looks like it'd be perfect with any outfit and the perfect size. Oh man, I forgot I wanted a bar cart! It would have been the perfect gift! Love your accessories ideas! So perfect! Hope you are feeling better! I feel the same way about these fitness trackers. But I am loving all the cute new fashionable ones! my obsession with all the bar cart and its accessories grows and grows. i love the dots on the glasses. have a great weekend babe! Those bar cart accessories are so cute! Hope you are feeling better. That DY bracelet is so fantastic. I'll take them all, please! I love the David Yurman bracelet! I have that Yurman bracelet and wear it every single day. It just goes with everything! I am loving that David Yurman bracelet, too bad that's way out of my reach. Spent far too much for christmas. I love the stemless wine glasses too, who doesn't need a little sparkle in their life? This needs to be my on christmas list. And those jawbones do not look like trackers! Whoa. I know that Anne Klein makes one that looks like a watch and Biana I think has one it looks gorgeous. I just use the fitbit one and clip it to my bra and no one's the wiser. I really like that one as opposed to the bracelet one since I already wear so much on my wrists. I love all of those bar accessories! You can never go wrong with David Yurman! I love my FitBit, but agree that it doesn't pair well with dressy clothes really, that Jawbone looks cute! Hope you are feeling better girl! Love all of those adorable bar accessories and Revas flats! Happy Friday to you! I am in love with those adorable flats! I've never been a TB fan but the gold and cork flats are precious! well i hope you're feeling better. you poor thing :( what a great list - i kinda want everything there!! especially the bracelet and bag! can't wait to see you tomorrow! Such a great wish list - I love the color of that purse! Hope you're feeling better, and enjoy your weekend! TB flats cannot be beat. They are expensive but so timeless and comfortable!! Loving the color of that purse! My husband wants a fitness tracker, but I think it would be too distracting for me. I would not be able to stop looking at it. Those Reva flats are gorgeous! I've been looking at a black and silver pair but didn't even see those on the site. Really unique indeed. Happy weekend! I love those Reva flats- they have got to be the most versatile and gorgeous pair I've ever seen! oh wow, they don't even look like fitness trackers! i do like that. i like my garmin for running but i kind of wanted one of those thingys to track steps and sleep and whatnot. i like that it doesn't look like one! oh, and i need that bag in my life, what a gorgeous colour.